Accessory current clamps expand a multimeter's flexibility and measurement capabilities by allowing it to measure up to thousands of amps. 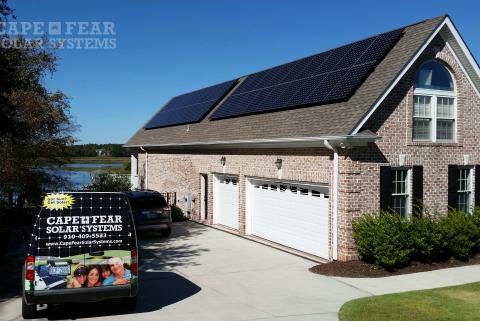 By themselves, most meters are limited to a 20 amp measurement for a short period. The clamp accessory reduces the actual measured current by a fixed ratio. That means the current maximum is now limited by the clamp instead of the multimeter. Note: This is not a complete user guide. Make sure to read the safety and usage information contained within the clamp's instruction sheets. The i200 connected to the Fluke 289 True-RMS Data Logging Multimeter and the i400 connected to the Fluke 87V Industrial Multimeter. Plugging in the i410 clamp. The i200, i400, 80i-400, and i800 are current transformer type clamps that have an output of 1 milliamp ac per amp ac. This is a 1000:1 ratio. They also have banana plug connections. These clamps do not measure dc current. 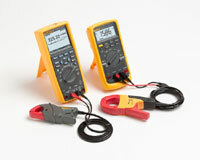 To use these clamps with a Fluke Digital multimeter, the meter must have a milliamp input jack. Plug the black output lead into the meter's common jack and the red output lead into the meter's milliamp or mA input jack. Set the meter's function switch to read ac milliamps. Place the clamp jaws around only one conductor of the circuit to be tested. Clamping around both the line and neutral conductors (like a line cord) at the same time will cancel the current flow reading. 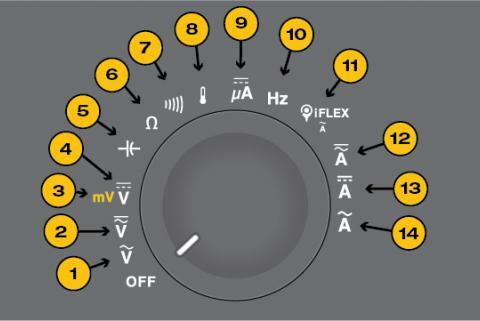 If there is current flowing in the circuit, the milliamp reading in the display will be the actual current flow in amps. The reading on the Fluke 87V Industrial Multimeter display (15.86 mA ac) corresponds to a true circuit current of 15.86 amps ac. The reading on the Fluke 289 True-RMS Data Logging Multimeter display (225.32 mA ac) corresponds to a true circuit current of 225.32 amps ac. The i410 and i1010 are ac/dc Hall Effect type clamps. That is, they contain Hall Effect sensors, and have internal electronics and a power switch. These clamps have an output of 1 millivolt ac per amp ac for ac current measurements and 1 millivolt dc per amp dc for dc current measurements. Again, these have a 1000:1 turns ratio. To use these clamps with a Fluke Digital multimeter, for best results the meter should have a millivolt range for either ac or dc voltage depending on the current to be measured. For ac current measurements, plug the black output lead into the meter's common jack and the red output lead into the meters V/? input jack. 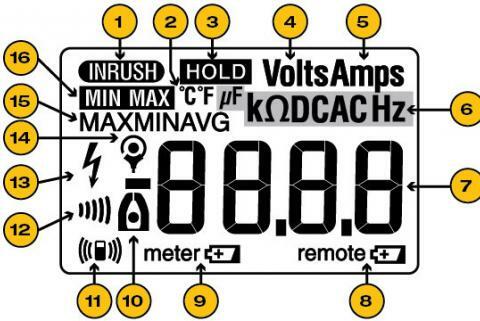 Set the meter's function switch to read ac voltage or ac millivolts. Place the clamp jaws around only one conductor of the circuit to be tested. Clamping around both the line and neutral conductors (like a line cord) at the same time will cancel the current flow reading. If there is current flowing in the circuit, the millivolt reading in the display will be the actual current flow in amps. 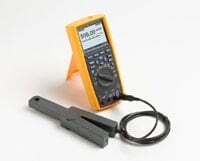 Connected to the i1010 clamp, the Fluke 289 True-RMS Data Logging Multimeter mV ac reading corresponds to a true circuit current in amps ac. The reading in the Fluke 289 True-RMS Data Logging Multimeter display (7.437 mV ac) corresponds to a true circuit current of 7.437 amps ac. For dc current measurements, plug the black output lead into the meter's common jack and the red output lead into the meters V/? input jack. Set the meter's function switch to read dc millivolts. Turn the clamp on by pressing the green power button. For the most accurate dc measurements, with the jaws closed use the "zero" adjust to zero the displayed reading before clamping around the current to be measured. This zero adjust is only required for dc measurements. Place the clamp jaws around only one conductor of the circuit to be tested. If there is current flowing in the circuit, the millivolt reading in the display will be the actual current flow in amps. This clamp was originally designed for use with an oscillioscope and terminates with a BNC style connector. To use it with a Digital multimeter, add a PM9081/001 BNC to dual banana adapter. For best results, the Digital multimeter should have a millivolt range for either ac or dc voltage, depending on the current to be measured. For ac current measurements, plug the black output connector into the meter's common jack and the red output connector into the meters V/? input jack. Set the meter's function switch to read AC millivolts or AC voltage. Turn the probe on by sliding the switch from "Off" to the appropriate range position, depending upon the current to be measured. 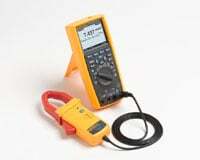 Example #1: With the Fluke 289 True-RMS Data Logging Multimeter connected to the 80i-110s clamp, at 100 mV/A, a 5 amp reading displays 500 millivolts. Example #2: At 10 mV/A, a reading of 25 amps displays 250 millivolts. Example #1. If measuring ? 10 amps, the probe output is 100 mV/A. For a reading of 5 amps the meter would display 500 millivolts. A reading of 10 amps would display as 1,000 millivolts or 1 volt. Example #2. If measuring greater than 10 amps but less than 100 amps, the probe output is 10 mV/A. For a reading of 25 amps the meter would display 250 millivolts. A reading of 100 amps would display as 1,000 millivolts or 1 volt. For dc current measurements, plug the black output connector into the meter's common jack and the red output connector into the meter's V/? input jack. Set the meter's function switch to read dc millivolts or dc voltage. Turn the probe ON by sliding the switch from "Off" to the appropriate range position depending upon the current to be measured. For the most accurate dc measurements, with the jaws closed use the "zero"adjust to zero the displayed reading before clamping around the current to be measured. This zero adjust is only required for dc measurements. Place the clamp jaws around only one conductor of the circuit to be tested. If there is current flowing in the circuit the millivolt reading in the display can be converted to the actual current flow in amps based on the above examples.